Standard access ticket for Saturday to the arena only. Pre-Pitch and Party returns once more to its location by the Campsite Village, providing you with ready to use tents close to the action of the Arena. 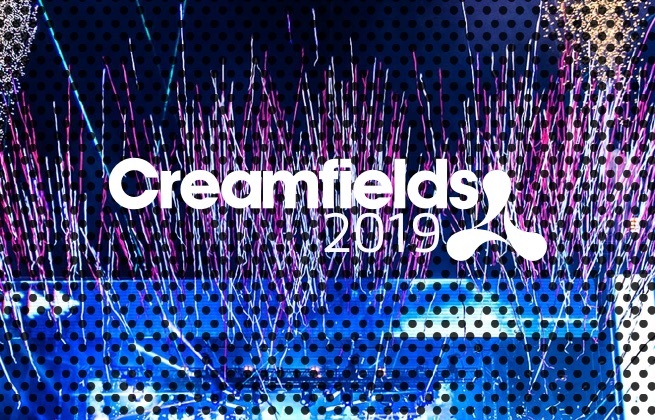 You can choose from a range of sizes and even add a sleep bundle so that you have even less to carry on your journey to Creamfields. This campsite is located next to the Campsite Village and Arena Entrance - as close to the party as you're going to get! The Pre-Pitch & Party Campsite is open from Thursday 22nd until Mon 26th August. The experience includes: - Your choice of a 2, 4, 6 or 8-person Pre-Pitched tent - Access to hot showers & proper toilets - 24-hour campsite reception - Private campsite located next to the Campsite Village and Arena Entrance Sleep Bundle information: You can choose to add our sleep-bundle, including sleeping mats and sleeping bags. **Important! ** Festival Tickets are not included in your accommodation price and must be booked separately. 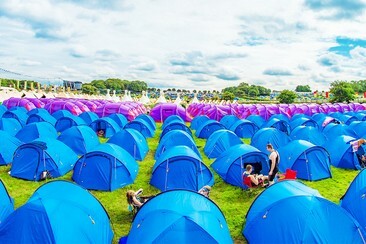 Everyone staying in your Pre-Pitched tent must have a 2, 3 or 4 day Bronze, Silver or Gold Camping ticket to gain entry. You can only use your accommodation for the 2, 3 or 4 days specified by your Bronze, Silver or Gold festival camping ticket(s). Pre-Pitch & Party is not accessible to those with a Standard Camping ticket. We will require a £50 refundable deposit upon check in. For Questions or Accessibility requirements - please email vipnation@livenation.co.uk or call VIP Nation on +44 (0)207 009 3484 before booking. All images are of expected delivered accommodations - but please be advised final products are subject to some minor changes (for example in furniture colouring or exact layout) depending on exact availability. Anyone beyond the advertised capacity will not be permitted to stay in the structures. VIP Nation and Creamfields are solely responsible for delivering the package. T&C's for entry to Creamfields can be found here www.creamfields.com/terms. 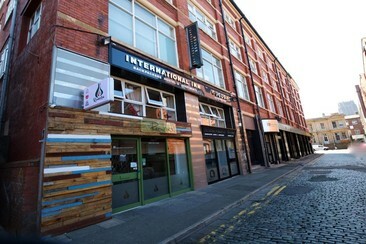 The uniquely designed Euro Hostel Liverpool is located in the heart of Liverpool's vibrant city centre, and features 52 colourful dormitories and guest rooms. The hostel also features the HOPSKOTCH Street Kitchen and Bar, which serves authentic international cuisine. The Hatch is an on-site live music venue & sports bar that showcases frequent music acts. Guests are also welcome to prepare their own meals in the shared kitchen. A variety of breakfasts, including continental and home-cooked options, is available each morning for an additional charge. Other hostel amenities include: a 24-hour front desk, individual lockers, complimentary Wi-Fi, a snacks & drinks vending machine, luggage storage, and a gift shop. The Euro Hostel is situated on the corner of Stanley Street and Mathew Street, an area made famous by The Beatles, and is only 84 yards from The Cavern Quarter, host of Liverpool's esteemed nightlife. 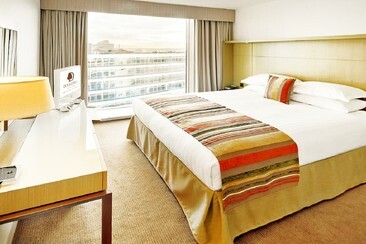 The Best Western Manchester Altrincham Cresta Court is perfectly located in one of the most exciting cities in the UK. This hotel is just a few miles from one of the largest retail parks in the country, the Trafford Centre. Well placed for Manchester Airport, the property is in Altrincham, 6.4 km from Manchester United FC and Lancashire Cricket Club - both 10 minutes by Metrolink and is close to the M60, M56 and M62 motorways. Modern rooms feature tea and coffee making facilities, free WiFi, and flat-screen TVs with satellite channels. 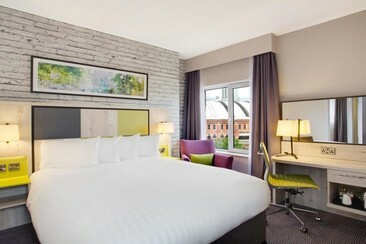 Located in the Birchwood Business Park, the Pentahotel Warrington offers stylish, modern rooms with free WI-FI. 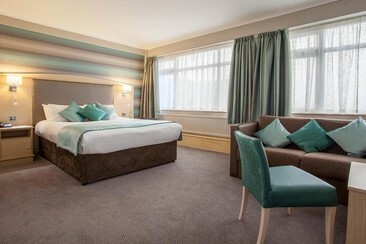 Colourful rooms at Pentahotel Warrington all feature air conditioning and tea and coffee-making facilities. Rooms also have a private bathroom with a power shower, and a flat-screen TV with on-demand movies. The hotel has a 24-hour reception desk and guests can enjoy an unlimited cooked breakfast available each morning from the on-site restaurant. The Pentalounge offers a wide selection of food and drink in a chilled out setting. There is also a car park on site for guests. 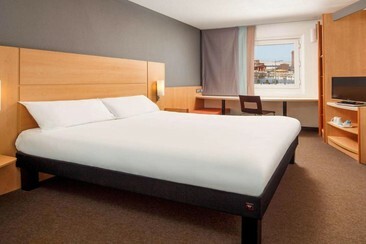 In Liverpool’s cultural quarter, Cocoon offers free Wi-Fi and budget modern pod rooms, between the 2 cathedrals. Lime Street Railway Station is a 10-minute walk away. Cocoon rooms are compact cabins, each one with a flat-screen LCD TV, an iPod dock, tea/coffee, and an en-suite bathroom. Cafes, bars, restaurants, and the central shopping district are a 5-minute walk away. Cocoon @ International Inn has an on-site internet cafe which provides breakfast. 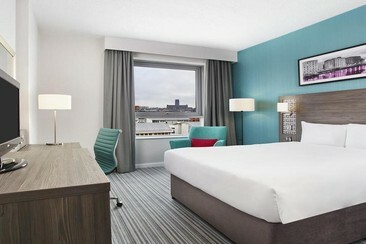 This hotel is in Liverpool city centre, opposite the Albert Dock and 350 yards from the Liverpool One shopping centre. It offers affordable rooms, a 24-hour snack and soft drink service, a bar, and parking for a fee. Rooms are decorated in light colours and feature a satellite TV, Wi-Fi access and a work desk. They include tea/coffee-making facilities, radio and a private bathroom with shower. Hairdryers are available from reception. The café serves a variety of international dishes, whilst the bar offers light snacks. The hotel also has a 24-hour reception. The Tate Liverpool and the Beatles Story museums are both just 350 yards away. Surrounding the dock there is a fantastic selection of pubs and shops, whilst Liverpool Lime Street Station is a 10-minute walk away. Please note that the ibis Liverpool Centre Albert Dock Hotel does not allow any person under the age of 18 to stay without an adult accompanying. The DoubleTree Manchester Piccadilly is a 10-minute walk from the King Street, Deansgate and the Arndale Centre shopping areas. Piccadilly Gardens is just 450 m away. Situated 37 m from Manchester’s Piccadilly Train Station, this stylish hotel boasts a fitness suite and air-conditioned rooms with free high-speed WiFi, flat screened TV and private bathrooms. Situated on the famous Liverpudlian docks, the Jurys Inn Liverpool is perfectly located right opposite the Echo Arena and Convention Centre. The hotel features 310 spacious and stylish guest rooms that are equipped with a variety of modern amenities. Each day a rich breakfast buffet is served in the hotel restaurant, which also offers an international dinner menu. The hotel bar also serves light lunches, snacks, and drinks from a seasonal bar menu. The Jurys Inn Liverpool also boasts an all-day Costa coffee bar. Other hotel amenities include: a 24-hour front desk, currency exchange, luggage storage, an on-site ATM/cash machine, and laundry & dry cleaning services. Public parking is available at a nearby location at the cost of £9/day. The Jurys Inn Liverpool is a 5-minute walk from the city centre, and a 10-minute walk from Liverpool Central Train Station. Albert Dock is right next door, and offers a range of attractions including shopping, bars, and museums. Situated in the heart of Manchester, this refurbished hotel is within walking distance of Deansgate and Manchester Oxford Road station. The property has 265 bright guest rooms with tea/coffee facilities and a private bathroom with luxury toiletries. Guests can enjoy breakfast in the contemporary restaurant also offering a varied evening menu. The spacious bar offers light snacks and beverages as well as a Costa Coffee Bar where guests can relax and make use of free Wi-Fi throughout. With a modern leisure centre and stylish restaurant, Daresbury Park Hotel & Spa is a 3-minute drive from the M56 motorway. Chester, Liverpool and Manchester are within a 30-minute drive. 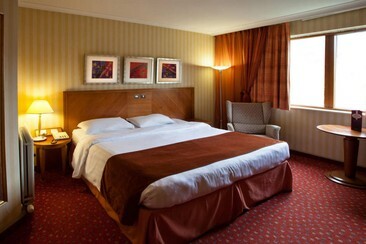 The 4-star bedrooms at Daresbury Park Hotel & Spa have a work desk and limited free WiFi access. All rooms feature a private bathroom with luxury toiletries, and a satellite TV with on-demand movies. Guests can enjoy freshly baked cookies and gourmet coffees in the Java Lounge, and Lounge Bar offers light snacks and drinks. The spa offers a range of indulgent treatments, and the fitness centre features a swimming pool, gym and squash courts. Daresbury Park is situated between Runcorn and Warrington, just a 20-minute drive from Chester Racecourse. There is free on-site parking, and the Peak District is a 40-minute drive away. An open return shuttle bus ticket for the day of your choice. A return coach from Derby, operated by Big Green Coach. A return coach from Coventry, operated by Big Green Coach. A return coach from Doncaster, operated by Big Green Coach. A return coach from Hull, operated by Big Green Coach. A return coach from Newport, operated by Big Green Coach. A return coach from Swansea, operated by Big Green Coach. A return coach from Newcastle-Upon-Tyne, operated by Big Green Coach. A return coach from Dartford Bluewater, operated by Big Green Coach.